We are pleased to announce details of our weekend and 1 week summer intensive Hockey Camps. All camps will be open to players of all age groups Under the age of 18, provided they are registered with the EIHA. The camps will all be based at Telford Ice Rink, and will take place on the weekend of the 21st/22nd of July. The weekend camps will follow the same schedule on both the Saturday & Sundays with arrival at 15-30 completing at 19:30. Each day will see the players on the ice for 2 hours. The Tigers Summer Camp is a great way to prepare for the new season whether to improve conditioning & timing ahead of League Games after a summer break or to focus on improvement of all fundamental skills required to compete at any level. This camp has developed a strong following from both local and national based players who are serious about improving their skills. The first session on ice will begin at 07:00 with players exiting each day at approximately 13:30. All camps will combine on ice practice with off ice training specific for hockey, focusing on speed/agility, strength/power & balance/coordination in a fun structured environment. WEEKEND CAMP COSTS – to include 4 hours ice at each camp. £90 for one, £160 for two, £230 for three. SUMMER CAMP COSTS – to include 15 hours ice time. £250 for the week or £230 for Telford Junior Members or those with siblings. All camps will be led by Tigers Head Coach & GM, Tom Watkins. 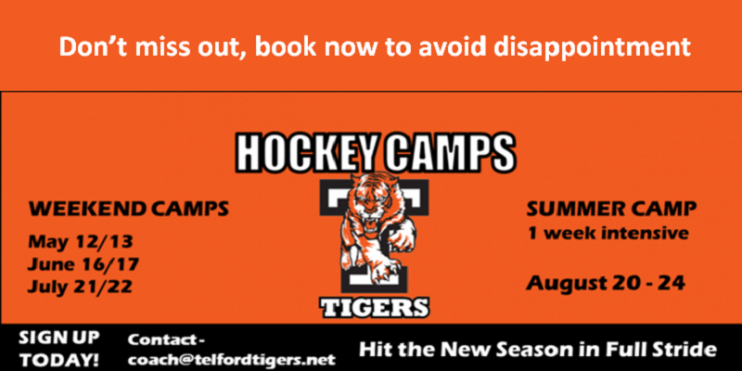 For further details or to request a booking form Email, coach@telfordtigers.net or register your interest online please follow the link below.